This double diner is easy on your eyes, and easy on your dog's stomach. The hand-crafted, beautiful scroll work design in black powder coat finish will be the first thing to catch your eye. The elegant design looks great in any environment, and with a black finish, this matches virtually any color scheme in your home. 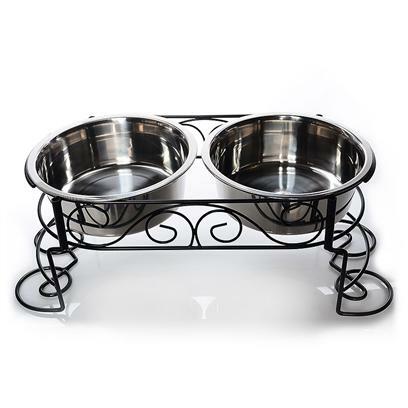 The Spot Mediterranean Stainless Steel Double Diner is raised, which isn't just aesthetically pleasing, it actually promotes healthy digestion in your dog. The less they have to bend down to eat, the easier it is on their stomachs. The pair of stainless steel dishes are removable and dishwasher safe. This is very easy to assemble, with absolutely no tools required.